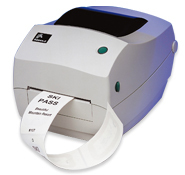 At TSBS, we carry a large line of thermal and direct barcode labels, including cleanroom labels and pharmaceutical labels. You’ll also find we have a full line of wireless scanner, printers and thermal ribbons. We are proud to have a partnership with Lgi for their CleanMark Products, which are tailored to your specifications. Lgi has a variety of products specifically designed for the rigid specifications of cleanrooms in the semiconductor, biotechnical and pharmaceutical industries. ClearMark sets the standard for cleanroom and pharmaceutical labels, and that is one of the reasons we are so pleased to offer their products. These labels are available in custom sizes and are available based on your specifications. They can be ordered in permanent or removable adhesive options. You have thermal transfer or direct thermal top-coat options and labels also come in three or one inch core options. If you are in search of pharmaceutical labels, we invite you to contact us at Tri-State Business Systems. We have built our reputation on consistent, quality products and superior customer service. If you have a special or customized need, please contact us.